Try to imagine what would happen if a large SUV like the Audi Q7 crashed into a small mini car like the Fiat 500. Not sure? 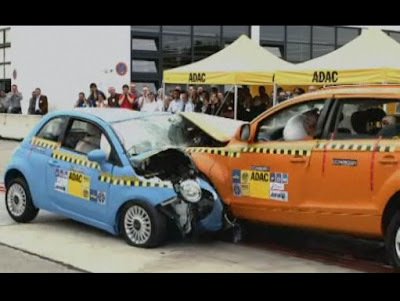 Well, Germany’s automobile club ADAC performed a “David vs Goliath” crash test between the two cars, but unlike the biblical story, David aka the Fiat 500, did not even come close to winning this match. The two cars collided head on at an average speed of 56 km/h (around 35mph). According to ADAC, whereas the driver and passengers of the Audi Q7 would have made it out of the crash with minor and non life-threatening injuries, the risk of serious injuries in the Fiat 500 was surprisingly high for both front and rear passengers. However despite what you may think, ADAC’s prime objective wasn’t to show that a large SUV is safer than a minicar but to point out that automakers should take smaller sized vehicles into consideration when they design a large size model.